Citation Information: J Clin Invest. 2018;128(8):3231-3233. https://doi.org/10.1172/JCI122045. Schematic diagram summarizing inside-out and outside-in elements of glomerular crescent formation. 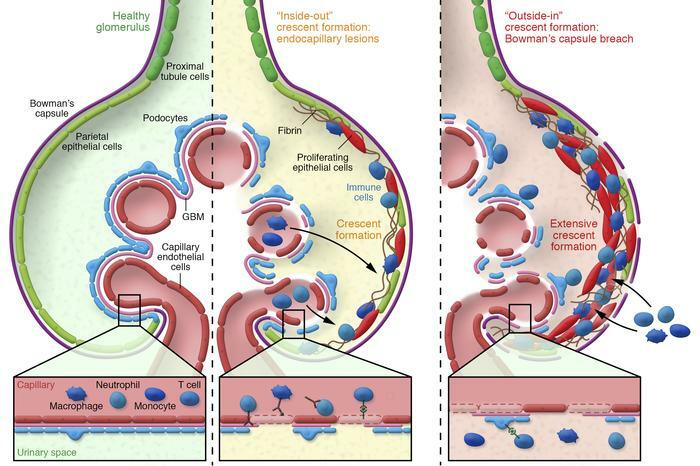 Left panel: The basic structure of a healthy glomerulus consisting of the Bowman’s capsule lined with parietal epithelial cells and the glomerular filtration barrier composed of endothelial cells, the glomerular basement membrane (GBM), and podocytes. Podocytes line the GBM with foot processes that wrap around the glomerular capillaries. Middle panel: Examples of some of the inside-out mechanisms that can cause endocapillary damage and early crescent formation following glomerulonephritis. Inset, left to right, neutrophils bind to autoantibodies in the GBM, as in anti-GBM glomerulonephritis. Antibodies bind to antigens lodged in the glomerulus with subsequent macrophage recruitment. ANCA activates neutrophils and mediates their recruitment to the glomerulus. CD8+ T cells can recognize antigenic peptides, potentially presented by endothelial cells. Right panel: Chen and colleagues describe the outside-in mechanism in which the antigen-specific CD8+ T cells, along with macrophages, located outside the glomerulus migrate into the urinary space following a breach in Bowman’s capsule. Within the urinary space, CD8+ cells recognize antigens presented on podocytes, exacerbating injury and crescent formation.